One day when I grow older I will understand the role of a Daddy, how to behave properly, how to always do the right things, how to be that ideal person that the popular press always glorifies. Until then, when I learn that trick, I’m going to have to be satisfied with just being the best person I can be, at that moment. Good or bad, I am what I am and I can’t pretend anything else. Thus, the story goes, a long long time ago, I made a silly promise that I will show my dogs the sea. They have never been to the sea, and they love playing and running with the family, so the only obstacles were transport and accommodation. When I mentioned this to the Minister Of Home Affairs, she used her favourite kitchen tool (Google, yes, to look up recipes and stuff) to find a dog-friendly log cabin in Hibberdene. Thus, she announced with a voice of finality, it is now my problem to find transport. And, she added with a voice of authority, it is her birthday soon and she wouldn’t mind being at the sea for that event, too. The only correct answer I have found that works in circumstances like that is: “Yes dear”. Not knowing what lies ahead I started preparing my 21-year-old rattle-ship gas-guzzler noisy-as-hell leaking-when-it-rains Toyota 4X4 bakkie. As it turned out she came through with flying colours and went all the way and back without a hitch. Actually there were no technical problems at all during this holiday. We all had a fantastic time. The dogs loved the ocean and ran until their legs gave in, Miriam was in awe about the size of the ocean, Robby had birthday flowers and chocolates waiting for her in the cabin, and the girls giggled the nights away in their “upstairs” loft room. So what does this mean? Where are we on this journey? I think this was a very significant weekend. The little one is slowly changing into the butterfly I always knew she would be. The next few weeks are going to be very hard, and it’s going to test us all. I’m already picking unnecessary fights because I’m nervous. The rocky road ahead is going to cut our feet and bruise our bodies. Are we strong enough? Are we going to fall apart, or were we sent on this holiday to cement our relationships and make us strong for the big battle? We’ll have to wait and see. I have to give recognition to Walter and Louise of Hibescape for providing us with a safe place, physically and emotionally, where we could rest. They made our stay very special and they come highly recommended. So, was I a good Daddy? Was my best good enough? 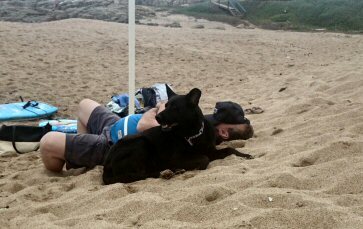 I had the most awesome naps on the beach with my dogs when they were tired, they think I’m awesome. The little one actually touched my cheek playfully instead of growling at me. Miriam saw the Indian Ocean in action. And the Wifey seems to have had a fun birthday too. And I made a QRP ham radio contact from the balcony. My wallet might be a lot thinner, but my memories are overflowing. And that is all I need to know. Posted on October 16th, 2014 under Family, Travel. Tags: Parenting, Road Signs, Travel. RSS 2.0 feed. Both comments and pings are currently closed.